I have an external hard drive that I bought in America that won't turn on in Europe. I have a Western Digital 1TB external hard drive that I bought in America and worked just fine. I just arrived in Paris and though I'm using a converter on the plug the external won't turn on. I carried the external in my laptop bag onto the plane, nothing happened that would suggest it could be broken. When I plug the power cable into the converter and then into the external, the light comes on then goes off, nothing starts to whir. I use the same converter to plug my laptop into and it works just fine. Is it because my laptop power cable has a surge protector that it works with this converter? Is my converter not limiting the watts enough for my external to turn on? Should I buy a better converter or buy a European power cable? 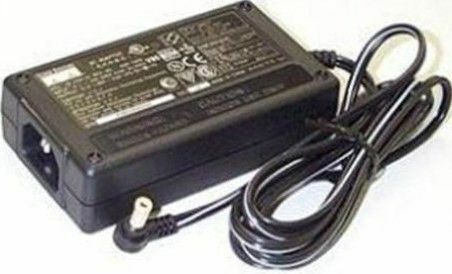 Most laptops have universal power supplies; they can run on 110 or 220 volts. It's pretty likely that your PSU for the western digital is not - it only works on 110v, so it's cutting out when on a higher voltage. If you look on your laptop supply, it should say something like "Input: 110-220V". I'm betting your WD psu will have "Input 110V", if anything is printed on it. Your best bet is to get a european power supply that will deliver the same voltage and current to the output, and has the same polarity for the device side plug. It might be simplest to pick up a travel/universal power supply, that can be adjusted to supply different voltages, and comes with a bag of changeable tips to fit multiple devices. You've almost certainly damaged the power supply for the drive and possibly the drive itself by running too high voltage into it. Check on the power supply, it probably lists something like 110-120VAC for the voltage input. Europe is 220-240VAC. Many power supplies are capable of handling all voltage ranges, like most laptop power supplies these days, but a lot of cheap and simple supplies, like the type often included with external drives, are only specced to one voltage range. If the latter is the case then you're going to need to replace the power supply at a minimum and maybe the drive itself, since Euro voltage is twice US voltage it's bad news for electronics. In future you need to check the voltage input on your devices before you plug them in in another country. If they say something like 110-120VAC you need a voltage converter to run them overseas, not just a plug adapter. If they are listed with 100-240VAC then they are good the world over and a simple plug adapter is all that's needed. ArkhanJG: Would this be something along the lines of what you're suggesting? 6550: I just checked the label on my plug it says "Input: 100-240V- 50-60 Hz 0.5A Max". So it should work fine with what I'm already using, but it's not. Take it and the converter to a computer repair place and see if they can verify that the thing is not damaged and that you're doing it right. Tell them your little sister plugged it in without asking you first. It will be less embarrassing should it turn out that you've done something they think is hilariously dumb. I was thinking more along the lines of one of these; it's a bit overkill for an external drive (it'll drive up to 21VAC and 2 Amps) but it works with pretty much anything, and would replace your drive supply. Assuming you buy it in france, it would come with a euro plug, so you'd not need your adapter plug. You'll definitely be able to pick one at an airport, at a rip-off price. No idea where you'd look in Paris for one though! Possibly a Fnac or Carrefour. The supply you linked would replace the plug converter, not the power supply, i.e. you'd go drive-> usual supply -> step transformer -> wall. Interesting that your supply says it should run on 220-240V. The light going on and off indicates it's cutting out; either too much current, or not enough. Ah, here's the exact thing I had in mind. Worldwide Input: AC 100-240v, 50/60Hz, adjusting automatically, Regulated Output: DC 3-4.5-6-7.5-9-12V, 1200mA max. I just checked the label on my plug it says "Input: 100-240V- 50-60 Hz 0.5A Max". So it should work fine with what I'm already using, but it's not. Huh, that's pretty strange. Have you ever successfully used the drive in a 240V country before? My next step would probably be to take it into a computer shop. They might have a WD power supply they can use to test the drive with. Barring that they might be able to order a supply or swap the drive into another case if you need to access the drive right away. It most certainly isn't the power. I also have a WD mybook 1TB drive and it works fine with a simple plug adapter because the power supply is able to accept high voltages. I am afraid that your drive is dead. Hopefully you can get your stuff off of it. How did you bring it in to the country? Was it in your hand luggage or was it in the hold? It was in my carry on backpack, I didn't have it in it's only little slip, but I was careful not to mess around with it. Could you try another 12V adapter and see if your disk at least lights up? When I lived in Paris, my router's powed adapter was 12V and fit my external WD perfectly, but didn't provide enough amps to use it reliably. Maybe your power adapter is faulty? Does it work if you plug your laptop into it? Sorry, just saw that it does light up, which means your converter isn't faulty. So I decided to just take it into a local shop that is on the Western Digital approved list (to not void the warranty) and get a price quote. I'm wondering, if the power cable can handle the voltage then is the problem most likely more mechanical then electrical? Do my files stand a chance of being all right? You don't need a "WD approved repair shop" or any other such nonsense, these things run on 12V 2A power supplies with a very standard size of barrel plug connector. You should be able to get a new AC to DC adapter from any good PC shop. I have four different manufacturers' external 3.5" HDDs, the power adapters for them are all rated on the output for 12V 2A and interchangeable between them. These things (WD External Drives) are just a fancy plastic case with some cheap circuitry and a real SATA drive inside which you can remove and plug into your desktop computer. I highly doubt that plugging in to a different voltage power source fried your drive. You are using an external power supply right? Those things are designed for any kind of voltage you will encounter from 110V to 240V. The only difference is the plug at the end which you stick into the wall. That is why my Kindle charger came with different "wall plug" bits which I could change around. I suspect that your problem is crappy cheap WD circuit boards preventing the power from getting to your drive. Crack the case, plug it into a desktop PC, and see what happens! So I came back to the US and took it into a local shop, they opened the case and the hard drive inside worked just fine. I'm going to buy a new case for it.